In a recent conversation about Mind Mapping, it became clear to us that many folks really don’t understand how to get started or why they would even want to Mind Map. Sadly, it was brought up because someone bought an iPad mapping app and didn’t know what to do with it. Hopefully though, owning the software will push them to try it out. They will be happy they did. Map Mapping can also be Brainstorming or Process Mapping or Research Outlines… they are being used by many people for many different things. When Tony Buzan came up with the concept, he was only trying to help people get ideas out of their heads so that they can be understood later and by others. A nice video you will want to take a look at is one from Philosophers Notes. They do a nice job of showing how to split out a book or a chapter of a book into a single view. The idea is that you have many lines of text in a book explaining a process which you can diagram out much easier to see the full picture on one page. If you search around the internet for discussion on mapping, most often you will find the higher end software or drawings examples. The ‘drawings’ or ‘figures’ head us towards the idea that an image is easier to remember. We are not completely sold on that concept since we use very few words on our maps. Tracy Gardner has done a video that we show folks on our team to help them get their heads around how items branch out from the central project. She users herself as an example of the center point and then the branches about her working outward. Try this on yourself, then on a subject like a activity you enjoy first, before getting into a meeting. Then, in a meeting it is much easier to take a project and direct the room on the many parts that make up a project into a single overview. Over the past year, we have mentioned several Mapping app options for the iPad. One, iThoughtsHD has remained inexpensive, continued to add robust features and understands the need for documentation. All three of which are not the norm for many of the more powerful apps these days. 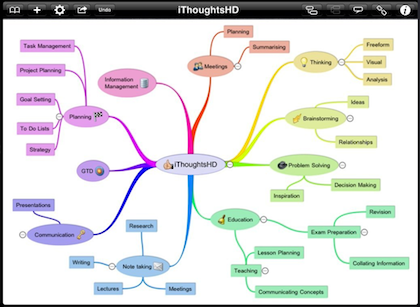 The creators of iThoughtsHD for the iPad also have extensive How To for getting the most out of the app when creating your own Mind Maps. 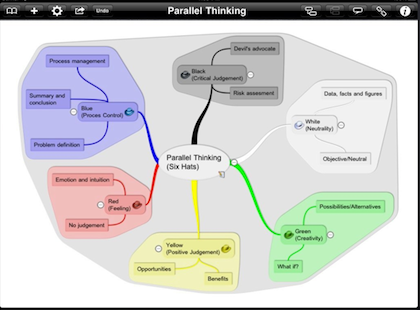 While a simple line map is better than nothing, a few of the features in iThoughtsHD has made it the one getting used more often lately: The ability to present in real time from the iPad to an external projector as maps are created, Floating topics (multiple maps on the same canvas), Boundary Topics (colored outline enclosing a group of topics.) and Callout Topics (like sticky notes.). Like we said, these wont be used too much in the beginning but as you saw from Tracy’s video, being able to encase lines as particular work flows is important when dividing work across the team. To wrap up… For the Tony Buzan fans… he does a fun interview about the mind’s ability to remember and why using colors when taking notes is important.